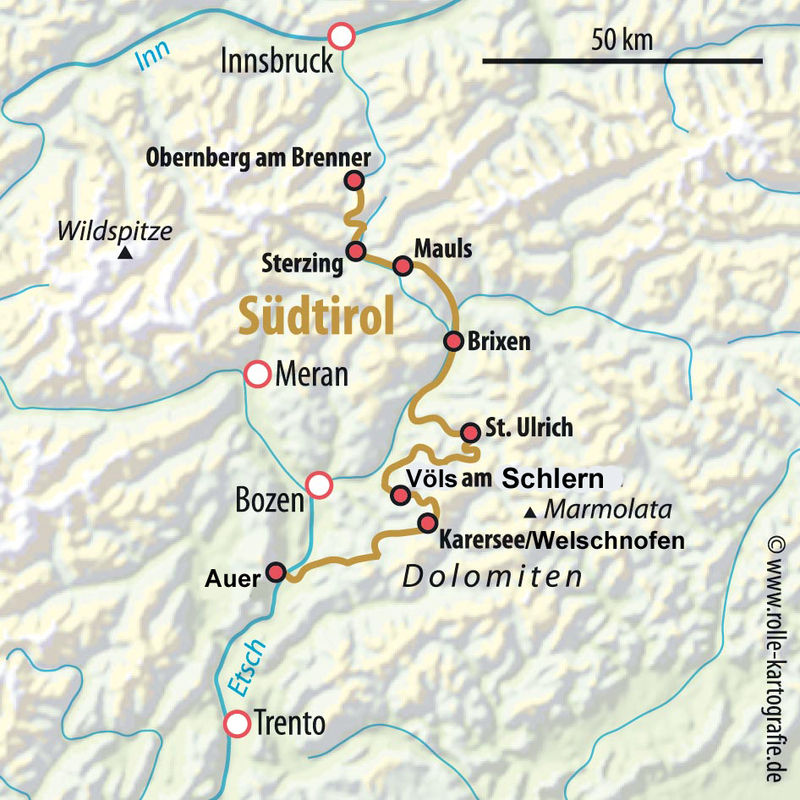 Starting at the Brenner border ridge, this dream tour goes through the most beautiful mountains in the world.The Dolomites in South Tyrol were chosen to be a World Heritage Site, and rightly so. Riding on great but not too challenging mountain bike trails, we'll discover all the beauty of this unique landscape. And every biker should have ridden the Brenner border ridge at least once. We offer the tour in two versions: the regular tour and the more difficult trail version. We stay overnight in very beautiful hotels of south tyrol. Riding the border ridge road, our tour starts off with a bang as we conquer the main ridge of the Alps. The ascent to Mussolini’s fortress world is difficult, but the military road reveals unique panoramas. We reach our destination via a mix of dynamite trails, forest paths and small secondary roads. We'll stay in a romantic hotel, enjoying the best cuisine. In the morning, the 2000 meter high Valler Jöchl awaits its conquerors. Once we've reached the top, we'll have a glorious view of all the peaks of the Dolomites. We'll take a break at South Tyrol's most beautiful mountain hut, then we'll enjoy every inch of our descent into the Eisac Valley. We'll stay overnight in a 4-star hotel located in the historic old town of Brixen. On hidden forest trails, we'll work our way to Klausen with its idyllic old town. The climb afterwards gives way to more gorgeous panoramas. After a lunch break in the typical Buschenschank (mixture of tavern + restaurant), we'll take the Poststeig path to Val Gardena. We'll stay the night in a solid 3-star hotel with sauna. The cable car takes us right up to the legendary Seiser Alm meadow. Thus we'll have plenty of time to enjoy the most beautiful mountains of the Dolomites: the Seceda, Geisler, Sella, Sasso Lungo, Piatto and Schlern. In this grand setting, we’ll ride along the Völser Weiher on our way to today's destination, a hotel in Tiers featuring good cuisine. After a first nice singletrack we'll have to really crank it as we head 700 meters up on our way to the Nigerpass. The massif of the Rosengarten group lies in front of us. The hut where we'll stop for lunch is located like an eagle's nest directly above the steep rock walls. From here, the view ranges from the Ortler almost to Lake Garda - simply breathtaking. We'll reach our destination early: A 4-star sport hotel with all the comforts and a view. The blue-green of the legendary Karersee and the white cliffs of the Latemar compose the morning's backdrop. Upon ascending the Lavazèjoch, we'll reach a rustic Italian mountain hut. Then we'll say our farewells to the Dolomites and roll on a railway line down to the Adige Valley. The wine-growing town Auer is our goal. We'll enjoy a multi-course farewell dinner. Oliver Gross, ALPS bike guide for the Transalp South Tyrol, Transalp Swiss and Transalp Trekking via Claudia. Arrival: Arrival by car or by train to Obernberg/Brenner/Austria. Type of route: Forest and gravel paths, paved secondary roads, trails, passages of pushing and carrying. Included in the price: Guided tour with 7 overnight stays and half board (breakfast buffet, multi-course dinner menus) in good 3- or 4-star hotels in a double room, often with wellness areas. Luggage transport, Cable car, return transfer in a comfortable bus. August: 03. /	24. /	25. ** /	31.